Pranayama ("breath control") is the fourth limb on the eight-limbed path of raja yoga. Sometimes described as the science of breath or extension of the breath, pranayama is a highly evolved system of practices that can enable men to gain control over the breath. It follows asanas, or the practice of physical poses, on the eight-runged ladder to self-realization. Pranayama is considered an invaluable practice because of the vital role that prana ("air," "breath," or "vital life-force energy") is believed to play in a man's physical, mental, and spiritual well-being. According to the tradition of yoga, prana is more than just air: It is the vital life energy that animates the being of not only every man, but also the entire world. The concept of a vital life energy that animates the entire universe is central to not only the yogic tradition, but also numerous other Asian civilizations, as well as to the belief systems of many indigenous peoples and shamanistic cultures. Breath is life. Without oxygen, we would perish within a matter of minutes. Our first experience of life is the first breath we inhale. We intuitively know the profound wisdom of the breath. It can be an indicator of an internal, emotional state or a state of health. Shallow, rapid breathing can be a sign of internal disorder and stress. Troubled or irregular breathing can be a sign of illness. Deep, rhythmic breathing makes us feel better. When trying to calm an anxious friend, we intuitively suggest: "Take a deep breath." Yogis have studied the power of the breath for millennia. They have discovered that by controlling the breath, we can control the mind. Thus, learning how to exercise appropriate control over the breath can be an invaluable tool on the road to liberation and the bliss of superconscious meditation. Most people breathe in a shallow fashion—from the chest. The most efficient breathing uses the abdomen and diaphragm fully, and is often called diaphragmatic breathing. Diaphragmatic breathing is more effective than chest breathing because it allows us to take in a greater amount of oxygen. Oxygen is vital to our sustained health and well-being. Once taken into the lungs, oxygen is transferred to the blood, where it circulates throughout a man's entire system. This oxygen is transferred down to the minute cell level, where it provides the unique and essential purpose of supplying the energy that each cell needs to accomplish its role. Without oxygen, our entire system would shut down and we would die. Once oxygen has been transferred to each cell, a trade takes place whereby carbon dioxide released as a result of metabolism within each cell is exchanged back into the blood. The blood carries it to the heart and lungs, from whence it is discharged back into the atmosphere through exhalation of the breath. This important role of oxygen is reflected in the use of the scientific term "vital capacity" to describe our ability to take in oxygen. Yogic breathing practices are designed to help us increase the amount of oxygen we take in, and consequently, increase our vital capacity. One of the most common techniques taught in pranayama is three-part yogic breathing. This technique brings one's awareness to the breath in such a way that the duration of each inhalation and exhalation is lengthened. One does this by mindfully inhaling air in three steps: first, into the belly; next, into the mid-chest; and finally, all the way up to the shoulders and collarbones. Once the inhalation is complete, the breath is exhaled in three parts: first, from the top of the chest; second, from the mid-chest; and finally, from the abdomen. This cycle of breathing is repeated a number of times to provide increased oxygenation to the body, as well as to relax and restore. A second popular breathing technique is called nadi shodhanam ("purification of the channels" or "channel cleansing"), known popularly as "Alternate Nostril Breathing." Yogis believe that energy flows through the body via a network of subtle energy channels, or nadis. 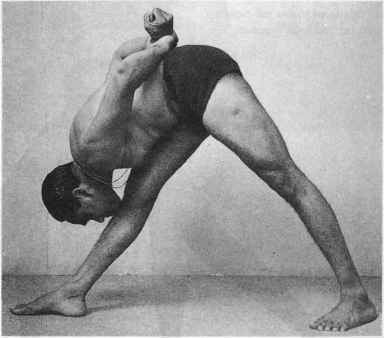 Chapter 7 describes the subtle anatomy of yoga, and Fig. 7.1 (page 79) illustrates the three main energy channels that circulate through the central core. The sushumna channel runs up through the center of the spine, and the ida (associated with feminine energy) and pingala (masculine) nadis intertwine around it. Energy travels through the ida and pingala nadis in a regular, cyclic pattern. Alternate Nostril Breathing is designed to help balance the flow of masculine and feminine energy, which represent opposite poles of the self in the body. This breathing practice also helps to balance the right and left hemispheres of the brain, and has a deeply harmonizing and unifying effect on the entire body/ mind/spirit. A third common yogic breathing technique is kapalabhati ("lustrous") breath. It is said to be the breath that makes the entire face radiant and lustrous. This pranayama technique entails rapid, forceful exhalations of the breath and relaxed inhalations. It is said to cleanse and purify the body. In addition, it warms the body, particularly the energy in the solar plexus, which is associated with the rising of the creative kundalini energy that is believed to lie at the base of the spine. Because of its warming effect, kapalabhati breath is also popularly called "breath of fire." There are many other yoga breathing techniques and exercises that have been developed over time. These techniques provide detailed instructions for precise ways to inhale, retain, and expel the breath. Many of these techniques are advanced and should be undertaken only under the guidance of an experienced instructor. The three pranayama exercises described in this section, however, are simple to perform. In fact, they are often incorporated into a hatha yoga class—sometimes at the beginning or end of a class, during the performance of the physical postures themselves, or as a relaxation or ener-gizer between postures. Because they are such powerful yoga techniques, you will find detailed information on how to incorporate them into your yoga practice in the following section. As with any technique presented in this book, however, do not undertake pranayama exercises if you have any medical concern without first consulting your primary healthcare provider.